I have brought you today an insanely quick pasta dish, that tastes great; I actually made it months ago just to use up some gorgonzola I had left from making this gorgeous salad and the recipe turned out to be a keeper - I did not expect less from the wonderful Stephanie Alexander . And to make this post a little more interesting I will share a link to one of the most beautiful videos I have ever seen, which I "stole" from the always great Awards Daily. 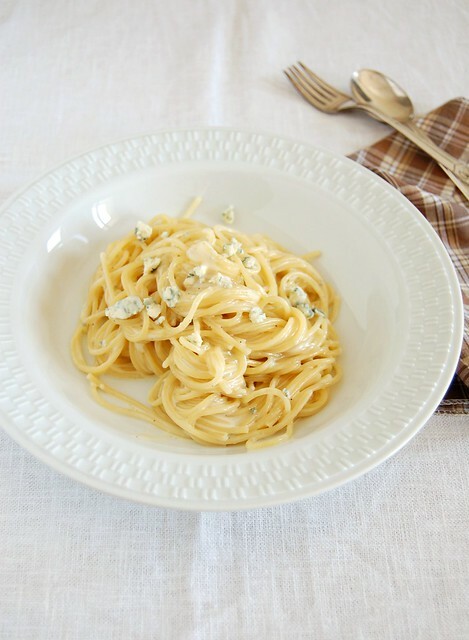 Combine the gorgonzola, milk, butter, salt and pepper in a heavy based frying pan over a gentle heat and cook, stirring with a wooden spoon, until thick and creamy. Add the cream, then raise the heat a little and cook, stirring, until sauce starts to thicken, about 5 minutes. In the meantime, cook the spaghetti until al dente. Drain well and tip into the frying pan. Toss quickly, sprinkle with the parmesan and extra gorgonzola and serve.